What I remember is the competition between the white sox and cubs! The difference in the standings, who had the better players, and what the manager was doing. But the main theme was Richy Allen. And did we have statistics to talk about him and his membership as a white sox player!!! I’am glad dad was a white sox fan and passed it on to me. He loved the white sox with his Panasonic portable radio. When the radio was on and dad was listening we all knew it was the white sox game. And I give thanks to mom for letting dad and my brothers get laoud with Jack Brickhouse!!!!! How can you pick just one memory? Allen had three by himself. The “chili dog” walk off home run game off Sparky Lyle June 4, 1972. The two inside the park home runs against Bert Blyleven on July 31, 1972 and the center field bleacher shot against Lindy McDaniel, August 23, 1972 stand out to me. Add in the four game series at Oakland in mid August which was the best regular season series for anybody in baseball in the decade of the 1970’s and there’s a plateful right there. I have been a White Sox fan for over 50 years. I am in touch with my favorite player, Walt Williams. I loved coming to the games and cheering for Walt!!!!! waiting by the door the players come out after the game and got another picture with him and got to talk to him. He put the “hustle” in the team!!! I enjoy the stories he shares with me and am proud to call him my friend. I was in 2nd grade and my grammar school, Most Holy Redeemer was offering summer baseball tickets if you had an A average or perfect attendance. I don’t remember having either but I got my tickets to 4 games. My father is a big Sox fan so he really enjoyed it. I think I have some old programs still. Now I thought Bucky Dent was on that year, maybe not. Going into the old park, hearing vendors yell cold beer, programs, get your peanuts here. Then coming up the steps and seeing the green grass of the out field was joy. It was my first year in little league. 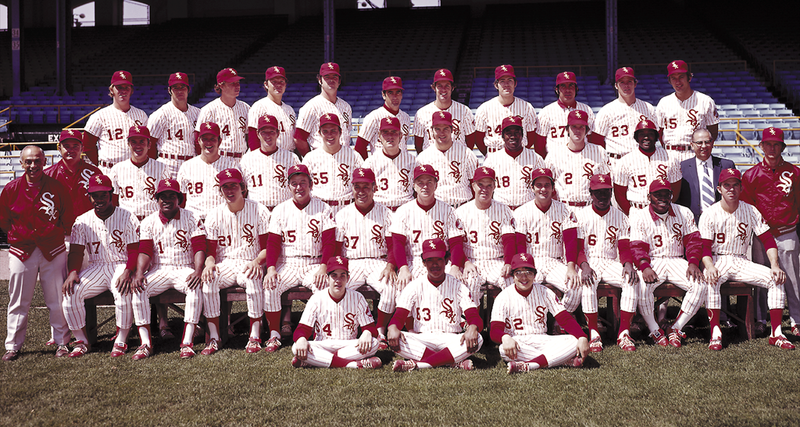 I felt in love with baseball that summer; it is why the red and white 1972 uniform is my favorite the Sox have ever worn.